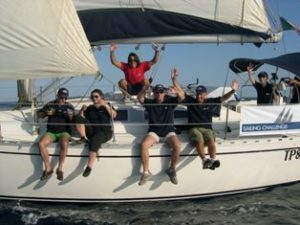 The regatta is an unusual teambuilding that deeply affects people and builds strong relationships. It has high educational potential while producing a fun experience. 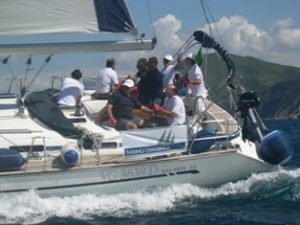 A technique of teambuilding very effective and moving, and increasingly popular, is the corporate regatta. Its special feature is that it contains two aspects of teambuilding (fun and construction / consolidation of the team) in a very, very high quantity and therefore can be chosen for the one or for the other purpose, or for both. If well managed, the regatta will give excellent results,making tangible the fact that a good team can hit very ambitious goals,even above expectations and beyond the capacities of the individual. Harmony,discipline, mutual confidence and determination make miracles: this is the explicit teaching of the race. The ideal situation where you will have the best outcomes is the company in which you live in an very marked competitive atmosphere, with ambitious goals and dynamism among people. If these energies are decomposed and selfish, individualism intoxicated sooner or later there will be problems, but if you channel them in a company sailing regatta you will have sensational results and lessons lightning. Moreover, the regatta is an ideal tool for pure relationship programs or incentive. The regatta is a complex task, which involves people deeply. 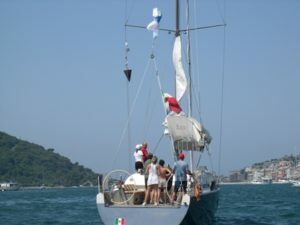 It creates expectations, forces people to know each other during the sailing training, stimulates the learning of new things, offers everyone an important role, asks a sense of responsibility, forces people to work hard and under stress and it produces tangible results, measurable and comparable. A good organization begins to communicate with the participants long time before. 3-4 of communications by which, on different occasions, it explains the program of the regatta, the dress code, weather forecasts, the details of the transfer, with a very addictive crescendo of expectation. We send a short booklet, “Sailing in 3 pages,” which is a summary of the most important sailing terms and concepts. It helps the guest to approach the world of sailing and it dissolves anxiety. The concepts are repeated several times and explained once again during at the briefing indoor. 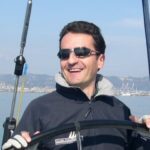 Thanks to these steps, when you get on board, the concepts and terms are no longer strangers … Everyone, even the absolute beginner can take part and regatta for real. The Company, depending on the purpose of the event, usually forms the crews. If, for example, it is an event of customer relationships, a sales or account will crew with its customers, if the aim is the training, the teams will be determined based on their roles in the company and will often coincide with the groups of work. If the event is purely reward / incentive, crews will be chosen even to the best of relationships between people. 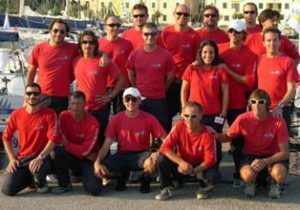 Crews are invited to give a name: they often choose ambitious names are chosen as Luna Rossa and Alinghi, or such historical name as Enterprise, or other mythological or funny names. 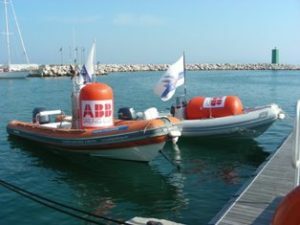 One of the most appropriate choices was made by the managers of the Perfetti Company who gave the names of their products to the boats: Goliath, Vigorsol, Vivident, Daygum, and so on. Sometimes there is also a customization: T-shirts, flags, banners. They are all initiatives to be encouraged. 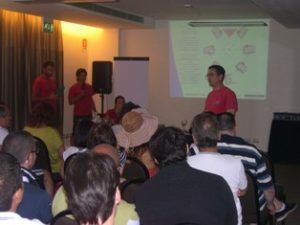 Usually, the night before the race there is a briefing: the program for the next day is reviewed, the skippers are presented, and so the teams. Then a dinner with the skipper, everyone at the table with his team. In the morning, we see the boats in the harbor: a bit of confusion, excitement, fear, we put our stuff on deck, sit in the cockpit and listen to the instructions of the skipper, our leader. We begin to see things more clearly; the winch is not just a name or a picture: I can hit and run, I can see the boom, I can handle the sheet. After twenty minutes of practical explanations, finally, it’s time to set sail, the skipper gives the tasks to the three ofus: ease forward, abaft spring! Free! You navigate! We leave the port by engine, but now in the open sea it is time to hoist the sails. Brief review of the operations and tasks. Got it all? Come on, you do it. To hoist the mainsail we have to be at least three persons, and if we do not coordinate, we will be exhausted and the sail won’t go up. We start getting the hint … Even Rossi, who claimed to be a real wimp, does her duty, and she succeeds. That braggart of Bianchi pinch his finger with the halyard and now he flies down. We unroll the jib and hook turn off the engine. That silence,only the rushing of the water! It’s…a miracle…! The boat goes, it goes right where we want! Learn how to tack, it’s pretty easy. If you go wrong, nothing irreparable happens. But if you get it right, you go faster. Then the jibe, i.e. the tack with the wind at your back. It is more difficult andif someone is wrong (not me or you,whoever) it is a mess. Be careful! All concentrated. We turn roles, and then we decide who will do what in the race. No one has a role in law, the ability is chosen in order to obtain the best result. There is work for everyone. We continue to train and improve every tack and jibe a bit. We are already wolves of the sea! Meanwhile they prepared the race course, the buoys are in the water. The skipper explains why they have those positions, it makes us see the imaginary line of departure, forcing us to use imagination to decide our moves and to predict those of their opponents.What if? Instructive exercise. In races do not mess around, says the skipper, all focused on your roles, no controversy, if one makes a mistake help him infix it. No personal initiatives.This is the way to win: if others are better they win. 10 minutes at the start: ok guys, let’s do it! The boats are close, they cross and touch each other, the skipper shouting “Water!” to ask precedence. We’re good, but another boat is approaching from astern, we overlapped. We take precedence but if they will approach a little more, they will ask “water” and we will have to give it. These are the rules. The helmsman asks speed … haul mainsail, jib, the boat leans slightly more and faster. What a feeling of power! The helmsman luff … do not give up, do not give up …we all think together. We like it. We cheer for us. 5 seconds, attention, guys! … 3, 2, 1 Go! The bow is perfecton the line. We are racing. I look at my winch: I am responsible, it does not run by itself, I (no one else) have to use it, I decide the right moment when ease sheet while tacking and, if we are leeward, when haul sheet, I decide to do everything at full speed, and to be careful that the sheet does not jam, or we will be in trouble. The other trust me and expects me to do everything perfectly, not “almost” perfect. Perfect. Since they have to do what comes next. They look at me. “Ready to tack,” cries the helmsman (communicating loud and clear). Ready! Ready! Ready! “I turn!” (Communicate to share). Everyone knows what to do. Depending on the wind, ease up my sheet just before or after a while, to help while tacking, but do not overdo, otherwise we will finish too leeward. I have to evaluate, plan, decide, execute. In fractions of a second. It ‘nice. My mouth is dry. The race continues and ends in agony. Stress releases. If we win, it’s because we were the best and deserve the compliments. If we do not win we understood why, and we know how we should do. If there is a next time we will do mistakes anymore. We learned how to learn. No one has lost. Only those who retired had lost because they did not hold on, and does not want to admit a mistake. As in life. We arrive in port “tired but happy”. With some little pain, maybe a bit bruised. This how you feel when you fight with the heart, but no one pays any attention. The best thing now is how you see your colleagues. They seem to be different. You got on boat with almost-stranger (some enemy? ), and now you got off to earth with friends. We understand that we are a great group, a brute force! If we want we can get the world. For tonight, a pizza will be okay. Regatta makes us hungry!